Planning the perfect wedding creates many challenges. Couples want to create the memorable wedding of their dreams, while not starting off their marriage atop a mountain of debt. One way to make things a little easier is to rent what you need for your wedding. Create your own venue from the ground up with beautiful tent structures designed for both elegance and comfort. It all starts with the perfect location – renting can take you the rest of the way. Tables of all types and sizes are available. Choose from guest tables, cake tables, the head table for the bridal party, and the buffet tables. Chairs are a must for a seated dinner buffet. If you are just planning a cocktail style reception you may get away with renting a number of chairs equal to half the number of guests. For added elegance linens and chair covers in a huge variety of colors and styles can help you make your wedding have a look of its own. Choose the perfect match to coordinate colors with your bridesmaid dresses and flowers. Select just the right tableware, china and glassware to complete your table settings. 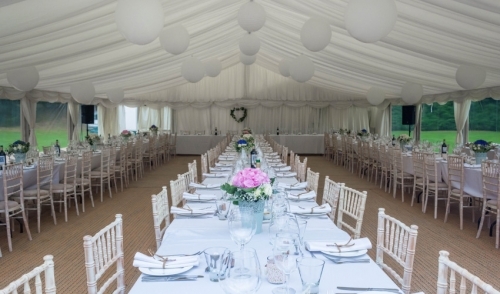 If you choose an outdoor venue, then tents should be considered no matter the weather. If there aren’t any nearby restroom facilities, be sure to rent the appropriate number of portable restrooms for the size of your reception. Lighting can be rented that will rival the elegance of most indoor venues. Keep comfort in mind by renting what you need. If the weather man predicts a cool evening, than heaters will keep your guests comfortable. If it’s a hot summer day, then fans or air-conditioners will do the trick. Save time and money by renting the perfect sound system for your needs. Make memories for your guests by providing a photo booth. Combined with a flatscreen TV to display the photos in real time, all of the guests can take part in the fun. Besides the enormous savings that can be gained by simply renting many of the items above, over purchasing them out right, there is also additional value. It’s the “know-how” that accompanies working with rental professionals. They are trained to help you make the right rental choices that will bring your dream wedding to life. Rental professionals will help ease the tension of pre-wedding set up with their experience and knowledge. As the event approaches you can count on them to help keep things on track if any changes are necessary.